You may have heard of Silicon Valley. Silicon Valley has long been known as the center of the tech world. Companies like Apple, Facebook, and Oracle have made homes there. The number of tech companies there even spawned a television show called Silicon Valley. However, have you heard of Silicon Beach in Los Angeles? Tech companies have been flocking to the great weather, better views, and the beach. Across LA, tech companies are flocking to the city. Not just the beach, but all-around LA. How many of these companies do you know? In Venice, you can find one of the Google campuses. These campuses are full of wonder. The accommodations are incredible, from on-site chefs to basketball courts; working for the leader of search definitely has its perks. Blizzard Entertainment holds one of the most loyal fanbases. Blizzard games are known to sell themselves, just because of who made them. They’ve made popular titles like World of Warcraft, which revolutionized the Massively Multiplayer Online Role-Playing Game (MMORPG) genre, as well as Overwatch, which was an immediate hit in the e-sport scene. Regarding the latter, Blizzard has even started the Overwatch League, which mimics a traditional sports league. You probably know Hulu, they’ve been disrupting the television industry since 2007 with their streaming service. Like another business on this list, they’ve also moved into original content, all streamed to your device. 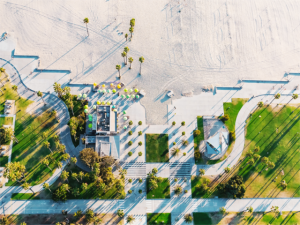 Hulu has chosen to be based out of beautiful Santa Monica, right on Silicon Beach, because they know that working in beauty helps you create beauty. Activision is a gaming giant. They published their first games in 1980 and have been eating up successful game developers ever since. Their parent company is Activision Blizzard, which was formed through a merger of Activision and Vivendi Games. Some of the biggest games Activision holds under their belt are the Call of Duty franchise, Destiny, and Skylanders. Snap hasn’t been around as long as some of the earlier entries on this list, but they’re huge on their own. Their only product is Snapchat, a very popular chat program that lets you take pictures, add filters, and send them to your friends. 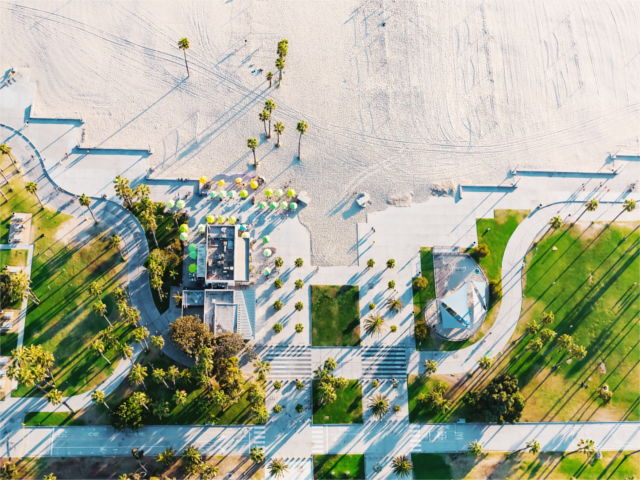 It’s hard to get around the social media space without hearing about Snap, and you can find their headquarters right here in Venice by the Boardwalk. You’ve probably used Ticketmaster before. They sell tickets for nearly every type of event, from Broadway to sports games. And if you’re in Los Angeles, you can see their headquarters in West Hollywood. A company born entirely online, Buzzfeed describes themselves as a social news and entertainment media company. Buzzfeed gets credit for changing the way we receive and share social content. They’ve been around since 2006, and you can find them right here in Los Angeles. Santa Monica Studio creates renowned first-party titles and franchises. You can thank them for God of War, and the Fat Princess Adventures games. You can see giant character models and in-game artwork on their campus that exemplifies the Santa Monica Studio’s passionate and creative culture. Los Angeles has a lot of gaming companies, and Electronic Arts is another big one. Electronic Arts has sports games, like the Madden NFL and FIFA titles. They’ve also developed shooter games like Battlefield and roleplaying games like Dragon Age. Whether you play games on your computer or console, you’ve probably played an EA title. Riot Games has been around since 2006. League of Legends earned their notoriety. This company has 1,500 local employees and is constantly keeping their games up to date. Right here in LA is the best computer repair shop you’ll find. They’ll repair your computer in the comfort of your own home with their outcall service. Simply call (310) 948-0588, or visit the website to schedule your computer repair. Who’s your favorite Los Angeles tech company? Let the world know on our Facebook page!